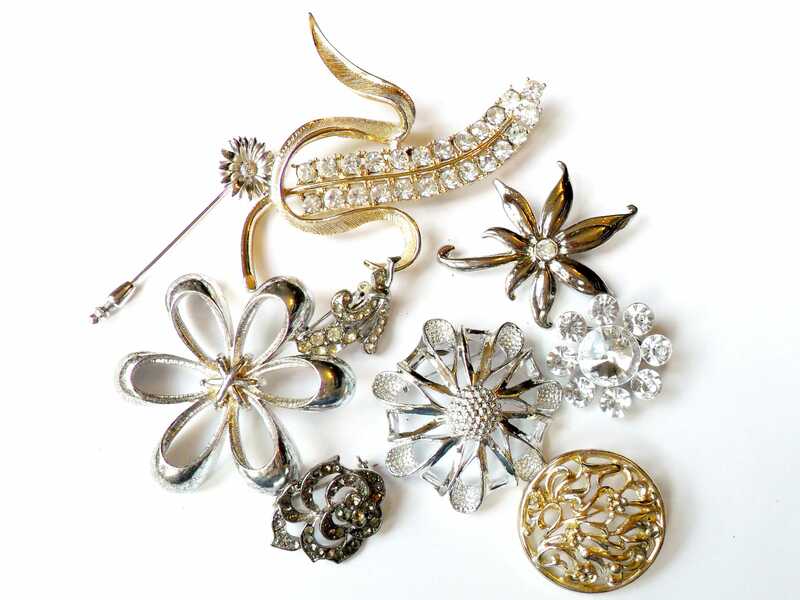 Beautiful lot of 9 sparkling silver tone metal and rhinestone brooches. Perfect for brooch bouquets or unique hair pieces. This brooch lot includes some signed pieces, including Sarah Coventry, Monet, Gerry's, and Trifari. The small rose brooch is missing a couple of little rhinestones but the rhinestones are present on all other pieces. Items will be packed in eco-friendly brown boxes, with gold or silver ribbons and bows. Gifts include a card. Please add gift message at checkout. 50% off all jewelry and small accessories! The items were perfect, exactly as described. The seller had wonderful communication and helped me to choose items that fit my needs. Extremely fast shipping! Love it just in time for Aries season. Most jewelry orders are packed in gift boxes and shipped in bubble mailers. Due to their bulky size, bangles are not packed in boxes. Orders include a copy of your purchase invoice, a thank you note, and a business card. We try to offer measurements that are as accurate as possible. Orders normally ship in 3-7 business days. Orders are shipped via United States Postal Service, and include tracking/delivery confirmation. You will receive an e-mail notification when your order ships. Your shipping notification will include the tracking number for your package. Under normal circumstances, packages within the US should arrive within 7-12 business days from the shipping date. Orders shipped via Priority Mail should arrive within 2-5 business days, but are not guaranteed. International shipping time frames vary greatly. Under normal circumstances, international orders should arrive within 1-4 weeks.